"Clean coal" redirects here. For the technology, see Clean coal technology. Coal pollution mitigation, often called clean coal, is a series of systems and technologies that seek to mitigate the pollution and other environmental effects normally associated with the burning (though not the mining or processing) of coal, which is widely regarded as the dirtiest of the common fuels for industrial processes and power generation. Approaches attempt to mitigate emissions of carbon dioxide (CO2) and other greenhouse gases, and radioactive materials, that arise from the use of coal, mainly for electrical power generation, using various technologies. Historical efforts to reduce coal pollution focused on flue-gas desulfurization starting in the 1850s and clean burn technologies. These efforts have been very successful in countries with strong environmental regulation, such as the US, where emissions of acid-rain causing compounds and particulates have been reduced by up to 90% since 1995. More recent developments include carbon capture and storage, which pumps and stores CO2 emissions underground, and integrated gasification combined cycle (IGCC) involve coal gasification, which provides a basis for increased efficiency and lower cost in capturing CO2 emissions. Of the 22 clean coal demonstration projects funded by the U.S. Department of Energy since 2003, none are in operation as of February 2017, having been abandoned or delayed due to capital budget overruns or discontinued because of excessive operating expenses. Since the 1970s, various policy and regulatory measures have driven coal pollution mitigation. In the US, the Clean Air Act was the primary driving force in reducing particulate emissions and acid rain from coal combustion. As regulations have increased the demand for coal pollution mitigation technologies, costs have fallen and performance has improved. The widespread deployment of pollution-control equipment to reduce sulphur dioxide, NOx and dust emissions is just one example that brought cleaner air to many countries. The desire to tackle rising CO2 emissions to address climate change later introduced Carbon Capture and Storage (CCS). 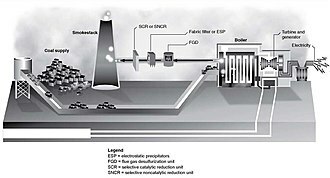 Within the United States, Carbon Capture and Storage technologies, also sometimes referred to as carbon capture and sequestration, are mainly being developed in response to regulations by the Environmental Protection Agency—most notably the Clean Air Act—and in anticipation of legislation that seeks to mitigate climate change. Loan guarantees and tax incentives have a long history of use in Australia, EU countries and the US to encourage the introduction of coal pollution mitigation and other technologies to reduce environmental impact. Combustion of coal--which is mostly carbon--produces carbon dioxide as a product of combustion. According to the United Nations Intergovernmental Panel on Climate Change, the burning of coal, a fossil fuel, is a significant contributor to global warming. (See the UN IPCC Fourth Assessment Report). For 1 ton of coal burned, 2.86 tons of carbon dioxide is created. Carbon sequestration technology has yet to be tested on a large scale and may not be safe or successful. Sequestered CO2 may eventually leak up through the ground, may lead to unexpected geological instability or may cause contamination of aquifers used for drinking water supplies. As 25.5% of the world's electrical generation in 2004 was from coal-fired generation (see world energy consumption), reaching the carbon dioxide reduction targets of the Kyoto Protocol will require modifications to how coal is used. By-products of coal combustion are compounds which are released into the atmosphere as a result of burning coal. Coal includes contaminants such as sulfur compounds and non-combustible minerals. When coal is burned, the minerals become ash (i.e particulate matter or PM) and the sulfur forms sulfur dioxide (SO2). Since air is mostly nitrogen, combustion of coal often leads to production of nitrogen oxides. Sulfur dioxide and nitrogen oxides are primary causes of acid rain. For many years--before greenhouse gasses were widely understood to be a threat-- it was thought that these by-products were the only drawback to using coal. These by-products are still a problem, but they have been greatly diminished in most advanced countries due to clean air regulations. It is possible to remove most of the sulfur dioxide (SO2), nitrogen oxides (NOx), and particulate matter (PM) emissions from the coal-burning process. For example, various techniques are used in a coal preparation plant to reduce the amount of non-combustible matter (i.e. ash) in the coal prior to burning. During combustion, fluidized bed combustion is used to reduce sulfur dioxide emissions. After burning, particulate matter (i.e. ash and dust) can be reduced using an electrostatic precipitator and sulfur dioxide emissions can be further reduced with Flue-gas desulfurization. Trace amounts of radionuclides are more difficult to remove. Coal-fired power plants are the largest aggregate source of the toxic heavy metal mercury: 50 tons per year come from coal power plants out of 150 tons emitted nationally in the USA and 5000 tons globally. However, according to the United States Geological Survey, the trace amounts of mercury in coal by-products do not pose a threat to public health. A study in 2013 found that Mercury found in the fish in the Pacific Ocean could possibly be linked to coal-fired plants in Asia. 2 into ammonium carbonate after which it is then transported and deposited underground (preferably in soil beneath the sea). This injection process however is by far the most expensive. Besides the cost of the equipment and the ammonium carbonate, the coal-fired power plant also needs to use 30% of its generated heat to do the injection (parasitic load). A test-setup has been done in the American Electric Power Mountaineer coal-burning power plant. One solution to reduce this thermal loss/parasitic load is to burn the pulverised load with pure oxygen instead of air. 2 from the exhaust fumes, making the process cheaper. This gasification process is done in new coal-burning power plants such as the coal-burning power plant at Tianjin, called "GreenGen". The projected nationwide costs for the implementing of carbon capture and storage (CCS) in coal-fired power plants in the USA (presumably using a conventional tactic, see above) can be found in the Wall Street Journal article. Credit Suisse Group says $15 billion needs to be invested in CCS over the next 10 years for it to play an important role in climate change. The International Energy Agency says $20 billion is needed. The Pew Center on Global Climate Change says the number is as high as $30 billion. Those figures dwarf the actual investments to date. In the US, the Bush administration spent about $2.5 billion on a range of mitigation technologies — a large amount, but far less than the amounts previously suggested. CCS proponents say both the government and the private sector need to step up their investments. The coal industry in the US has the potential to make billions of dollars if clean coal technologies are pursued. It is estimated that from 2000 to 2020 the industry could make up to $15 billion in reduced fuel costs, $25 billion in avoided environmental costs, and $32 billion from exporting the equipment and licensing for use in other countries. In 2014 SaskPower a provincial-owned electric utility finished renovations on Boundary Dam’s boiler number 3 making it the worlds first post-combustion carbon capture storage facility. The renovation project ended up costing a little over $1.2 billion and can scrub out CO2 and other toxin from up to 90 percent of the flue gas that it emits. 2 than any other country. Researchers in China are focusing on increasing efficiency of burning coal so they can get more power out of less coal. It is estimated that new high efficiency power plants could reduce CO2 emission by 7% because they won't have to burn as much coal to get the same amount of power. Following the catastrophic failure of the Fukushima I Nuclear Power Plant in Japan that resulted from the 2011 Tōhoku earthquake and tsunami, and the subsequent widespread public opposition against nuclear power, high energy, lower emission (HELE) coal power plants were increasingly favored by the Shinzō Abe-led government to recoup lost energy capacity from the partial shutdown of nuclear power plants in Japan and to replace aging coal and oil-fired power plants, while meeting 2030 emission targets of the Paris Agreement. 45 HELE power plants have been planned, purportedly to employ integrated gasification fuel cell cycle, a further development of integrated gasification combined cycle. Japan had adopted prior pilot projects on IGCC coal power plants in the early-1990s and late-2000s. In the United States, "clean coal" was mentioned by former President George W. Bush on several occasions, including his 2007 State of the Union Address. Bush's position was that carbon capture and storage technologies should be encouraged as one means to reduce the country's dependence on foreign oil. During the US Presidential campaign for 2008, both candidates John McCain and Barack Obama expressed interest in the development of CCS technologies as part of an overall comprehensive energy plan. The development of pollution mitigation technologies could also create export business for the United States or any other country working on it. The American Reinvestment and Recovery Act, signed in 2009 by President Obama, allocated $3.4 billion for advanced carbon capture and storage technologies, including demonstration projects. Former Secretary of State Hillary Clinton has said that "we should strive to have new electricity generation come from other sources, such as clean coal and renewables,” and former Energy Secretary Dr. Steven Chu has said that “It is absolutely worthwhile to invest in carbon capture and storage", noting that even if the U.S. and Europe turned their backs on coal, developing nations like India and China would likely not. During the first 2012 United States presidential election debate, Mitt Romney expressed his support for clean coal, and claimed that current federal policies were hampering the coal industry. Environmentalists such as Dan Becker, director of the Sierra Club's Global Warming and Energy Program, believes that the term "clean coal" is misleading: "There is no such thing as clean coal and there never will be. It's an oxymoron." The Sierra Club's Coal Campaign has launched a site refuting the clean coal statements and advertising of the coal industry. Complaints focus on the environmental impacts of coal extraction, high costs to sequester carbon, and uncertainty of how to manage end result pollutants and radionuclides. In reference to sequestration of carbon, concerns exist about whether geologic storage of CO2 in reservoirs, aquifers, etc., is indefinite/permanent. The palaeontologist and influential environmental activist Tim Flannery made the assertion that the concept of clean coal might not be viable for all geographical locations. Critics also believe that the continuing construction of coal-powered plants (whether or not they use carbon sequestration techniques) encourages unsustainable mining practices for coal, which can strip away mountains, hillsides, and natural areas. They also point out that there can be a large amount of energy required and pollution emitted in transporting the coal to the power plants. The Reality Coalition, a US non-profit climate organization composed of the Alliance for Climate Protection, the Sierra Club, the National Wildlife Federation, the Natural Resources Defense Council and the League of Conservation Voters, ran a series of television commercials in 2008 and 2009. The commercials were highly critical of attempts to mitigate coal's pollution, stating that without capturing CO2 emissions and storing it safely that it cannot be called "clean coal". Greenpeace is a major opponent of the concept, because they view emissions and wastes as not being avoided but instead transferred from one waste stream to another. According to Greenpeace USA's Executive Director Phil Radford speaking in 2012, "even the industry figures it will take 10 or 20 years to arrive, and we need solutions sooner than that. We need to scale up renewable energy; “clean coal” is a distraction from that." The term Clean Coal in modern society often refers to the carbon capture and storage process. The term has been used by advertisers, lobbyists, and politicians such as Donald Trump. The industry term "clean coal" is increasingly used in reference to carbon capture and storage, an advanced theoretical process that would eliminate or significantly reduce carbon dioxide emissions from coal-based plants and permanently sequester them. More generally, the term has been found in modern usage to describe technologies designed to enhance both the efficiency and the environmental acceptability of coal extraction, preparation, and use. "The term clean coal technology means any technology...deployed at a new or existing facility which will achieve significant reductions in air emissions of sulfur dioxide or oxides of nitrogen associated with the utilization of coal in the generation of electricity." Before being adopted in this fashion, historically "clean coal" was used to refer to clean-burning coal with low levels of impurities, though this term faded after rates of domestic coal usage dropped. The term appeared in a speech to mine workers in 1918, in context indicating coal that was "free of dirt and impurities." In the early 20th century, prior to World War II, clean coal (also called "smokeless coal") generally referred to anthracite and high-grade bituminous coal, used for cooking and home heating. ^ Nijhuis, Michelle (April 2014). "Can Coal Ever Be Clean?". National Geographic. ^ "Countries betting tech can clean up coal – IB89005: Global Climate Change". CNN International. July 13, 2009. Archived from the original on July 18, 2009. Retrieved 2009-07-20. ^ "Daily Wrap Up for July 16 – Energy". International Business Times. July 16, 2009. Retrieved 2009-07-17. ^ Morton, Adam (July 9, 2009). "Divided views over 'clean coal' pilot project". Melbourne: The Age. Retrieved 2009-07-17. ^ "Make-or-break summit as G8 gamble on climate and economy". The Australian. July 6, 2009. Retrieved 2009-07-17. ^ "The 1986–93 Clean Coal Technology Program". US Department of Energy. 21 April 2011. Retrieved 2011-04-21. ^ "Clean Coal Technology" (PDF). www.nma.org. NMA. ^ "Clean Coal Power Initiative". Energy.gov. U.S. Department of Energy Office of Fossil Energy. Retrieved 26 January 2017. ^ a b c "Clean Coal Technologies: Accelerating Commercial and Policy Drivers for Deployment" (PDF). www.iea.org. International Energy Agency. ^ "Carbon Dioxide Emission Factors for Coal, Energy Information Administration, Quarterly Coal Report, January–April 1994". ^ "CRS Issue Brief for Congress – IB89005: Global Climate Change". National Council for Science and the Environment. August 13, 2001. Archived from the original on December 26, 2008. Retrieved 2008-09-13. ^ Alex Gabbard. "Coal Combustion: Nuclear Resource or Danger?". Oak Ridge National Laboratory. Archived from the original on 2007-02-05. Retrieved 2008-08-09. ^ Ball, Jeffrey (2009-03-20). "Coal Hard Facts: Cleaning It Won't Be Dirt Cheap". The Wall Street Journal. ^ a b Nijhuis, Michelle (April 2014). "Can Coal Ever Be Clean?". National Geographic. ^ "US News, Why clean coal is years away". US News. 2009-03-17. Archived from the original on 2009-03-29. ^ Bezdek, Roger H.; Wendling, Robert M. (2013-03-01). "The return on investment of the clean coal technology program in the USA". Energy Policy. Decades of Diesel. 54: 104–112. doi:10.1016/j.enpol.2012.10.076. ^ a b Danko, Pete (2014-10-02). "World's First Full-Scale 'Clean' Coal Plant Opens in Canada". Retrieved 2017-04-27. ^ "China's Emissions: More Than U.S. Plus Europe, and Still Rising". The New York Times. 2018-01-25. ^ "Chinese coal fuels rise in global carbon emissions". The Times. 2017-11-14. ^ "Yes, The U.S. Leads All Countries In Reducing Carbon Emissions". Forbes. 2017-10-24. ^ "World carbon dioxide emissions data by country: China speeds ahead of the rest". The Guardian. 2011-01-31. ^ "China now no. 1 in CO2 emissions; USA in second position". PBL Netherlands Environmental Assessment Agency. ^ a b "China's drive to clean up its coal power, one plant at a time". New Scientist. Retrieved 2017-05-04. ^ McHugh, Babs (2017-02-23). "Japanese government planning to build 45 new coal fired power stations to diversify supply". ABC Online. Retrieved 2017-02-23. ^ Watanabe, Chisaki (2015-11-10). "Want to Burn Coal and Save the Planet? Japan Touts a Solution". Bloomberg. Retrieved 2017-02-23. ^ "Transcript And Audio: First Obama-Romney Debate". NPR. Federal News Service. 2012-10-03. Retrieved 2013-05-24. ^ Conditt, Jessica (March 30, 2017). "Dear Donald Trump: 'Clean coal' doesn't exist". Retrieved 2017-04-14. ^ "The definition of clean coal « Behind The Plug". Archived from the original on 2013-02-21. Retrieved 2012-08-28. ^ ""Clean coal" history lesson". Archived from the original on 2012-08-31. Retrieved 2012-08-28. ^ "Smokeless Coal," WVa-USA.com, accessed May 2008.